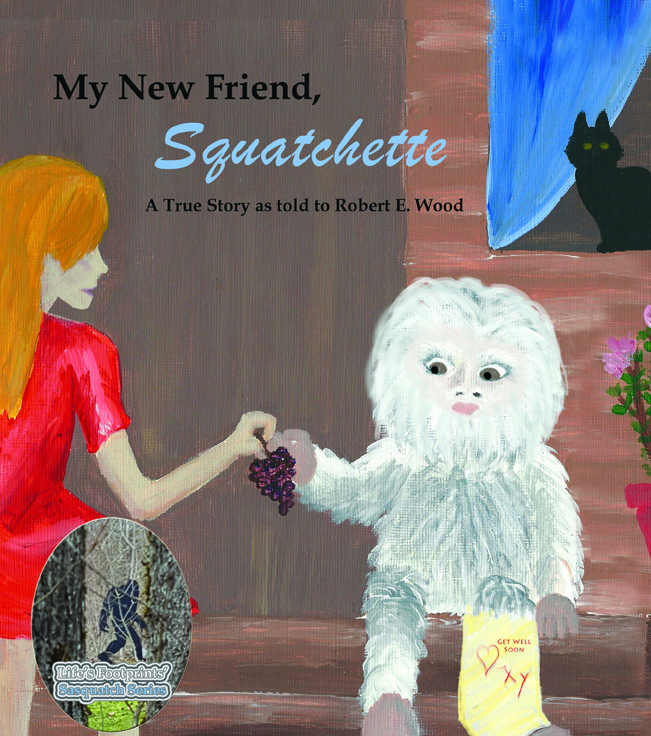 The first installment in the Life's Footprints' Sasquatch Series is My New Friend, Squatchette A True Story as told to Robert E. Wood. It is the story of a young girl, Xylina, who stays with her grandfather in a beautiful part of the world. There in the lush forest setting berries can be plucked off bushes and the squirrels and wild birds are constant neighbors. Soon after Xylina arrives she and her grandfather make an extraordinary discovery. Late at night a momma sasquatch, carrying her injured baby sasquatch, appears outside the house in hopes for the best from these terrifying humans. Over the next several weeks the best is revealed, and a remarkable relationship takes shape among the members of this unlikely group. Xylina names the baby Squatchette and takes great pains to ensure her comfort and healing. When the pair take leave from one another, it is in an illuminated state. This relationship is at the heart of the story and it is what makes the story soar. Such magic is to be expected, after all, in such a magical setting. It will delight children of many ages and adults as well.